Our Check ‘n Go review pairs consumer feedback with need-to-know information to help you decide if this fast-cash solution is the right choice for you. "Fast cash, payday" businesses like Check ‘n Go seem like the quickest, easiest solution when you need money in a hurry. But before you get a payday loan or use a check cashing service, it is important to fully understand how these financial products work. The last thing you want to do is make your financial situation more stressful. Is Check ‘n Go the right choice for you? Check ‘n Go was founded in Covington, Kentucky in 1994 for people who need to borrow money within minutes. Whether you need money to hold you over until your next paycheck or a check cashed, Check ‘n Go promises to help. The company bills itself as a one-stop shop for all of your fast cash needs. 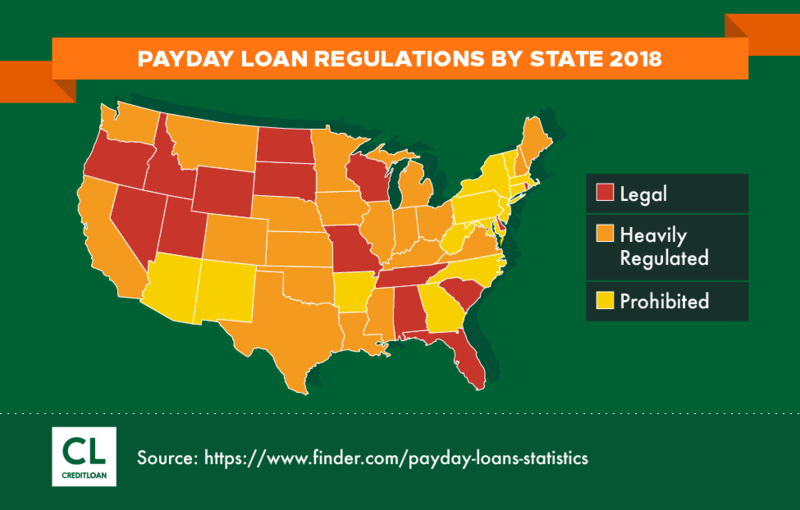 Depending on where you live, you may not be able to use these services because certain states prohibit payday loans. Check the corporate website for a complete list the most up-to-date information. Check ‘n Go offers several financial solutions into its popular payday loans. Not all of these are interest-accruing but all include paying extra for the service, whether that is via fee or interest. These loans provide you with the money you need to make it to your next payday. They can prevent overdraft fees and credit card charges, and ensure your bills are paid on time. The money can be deposited into your account as soon as the next day. This type of loan lets you borrow more money over time, and puts you on a fixed payment schedule. Check ‘n Go offers a few options as to how much money you can borrow, how much payments will be, and how many payments you will need to make. The money can be deposited into your account as soon as the next day. Temporary budget jam? A cash advance is a short-term, unsecured loan of up to $1,500 that lets you receive funds from your next paycheck. Upon applying online, Check ‘n Go lets you know how much money you can get. Once approved, you can use the money to pay off what you need to. When the cash advance is due, typically on your next payday, clients pay Check ‘n Go back the full amount along with a fee. Convenient locations throughout the United States enable you to cash checks in an instant. You simply pay a one-time flat fee that is disclosed before you use the service. In many cases, the cost to cash a check is less than the cost of a bank's standard overdraft fee.This service is currently available in Ohio, Florida, Kansas, Kentucky, Michigan, Missouri, Tennessee, and Texas. Check ‘n Go states on its website that more states will be offering this service soon. This prepaid credit card gives you quick access to extra funds whenever you need it, and can be linked to your bank accounts so paychecks are deposited quickly. Because prepaid debit cards only hold the amount that you deposit, they cannot be overdrawn, so you won't pay extra fees or interest like a regular credit card. Just pay an initial and deposit fee—typically less than you'd pay for a credit card overdraft or late fee—and you're on your way.The card doesn't affect your credit, and using it can protect you from identity theft. This service isn't about getting quick cash but rather gives you a secure way to spend. Get the cash you need, on terms that work for you. Whether you need money to hold you over until your next paycheck or a check cashed, Check ‘n Go promises to help. The company bills itself as a one-stop shop for all of your fast cash needs. Different solutions require different qualifications; some—like installment loans—require a credit check. The best way to see if you qualify is to visit the company's website or contact them directly. Once approved, the funds are deposited into your account as soon as the next business day. The company emphasizes that you will be made aware of when your payments are due, how much the balance is, the interest rate, and when the full amount must be paid off. Check ‘n Go charges a fixed interest rate for payday loans and cash advances based on state, and annual percentage rates can vary from 285.16% to 1,520.83% (Utah). For example, the APR for a $450 payday loan in Michigan is 347.33%; in Kansas, it's 391.07%; and in Texas, it's 661.75%. For people who know they will be able to quickly pay back a loan, or need a one-time, temporary solution, Check ‘n Go may be their best option. One positive reviewer emphasized having a complete understanding of what they were signing up for, which is why they did not encounter issues. I have used the service a couple of times and did not have a problem…Since I realize that places like these are only a TEMPORARY solution, and I knew I had no DOUBT that I could pay the loan as required, I had a very positive experience. However, other borrowers may not want to use the services because they have high interest rates and potentially damage credit scores. These drawbacks and others need to be considered. From issues regarding repayment options to poor customer service, reviewers have highlighted reasons not to use Check ‘n Go. The nationwide APR average for Check ‘n Go payday loans is about 390%. (Not a typo!) If you take a loan of $150, you will be paying back approximately $172 and change if you pay it on time. If not, you could wind up paying nearly four times that amount—or more if you delay paying the balance. In Texas, a $750 loan would carry a $190.38 finance charge. That's a fee equal to 25% of the amount financed, plus interest paid to the unaffiliated lender, and the fee remains the same whether the loan is delivered online or in-store. If the loan is repaid within 14 days, the APR would be 661.78%. However, if it is repaid within 30 days, the APR would be 314.16%. Unsurprisingly, this is the chief complaint with Check ‘n Go. According to one customer, "Even if you want to cash checks, they charge way too much." Studies show that the average borrower will take out eight loans worth $375 over their lifetime. If one of those is with Check ‘n Go at its current interest rate, that means he/she will $520 on interest for each one by the time the initial loan balance is paid off. If you pay off all of those eight loans the same way, that equates to paying $7,160 — just to get the original loan amount of $3,000. 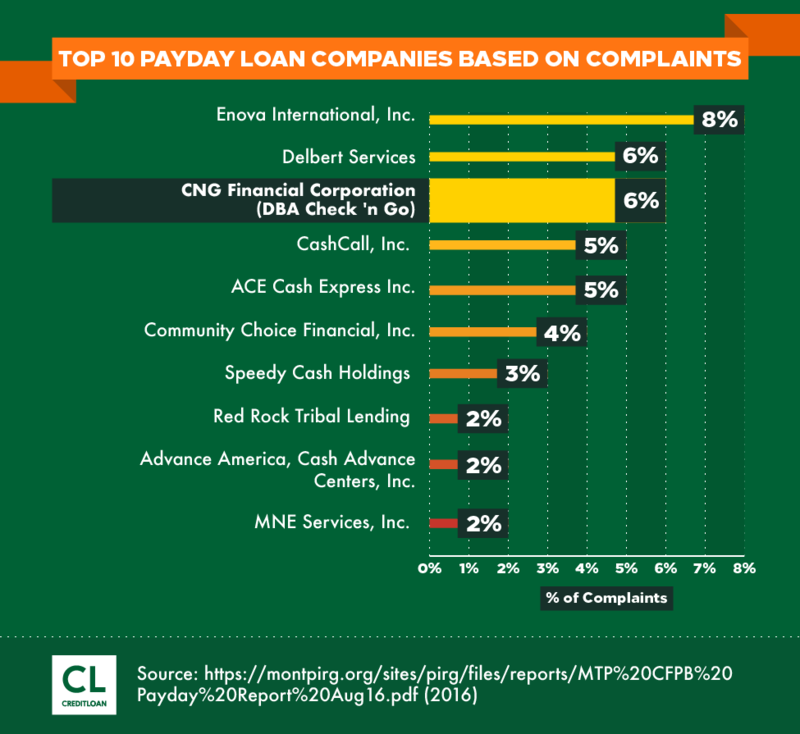 A review on ConsumerAffairs said that the company checked the borrower's credit every time he/she applied for a payday loan. The credit check was made by Check ‘n Go, or Axcess Financial Services. According to the borrower, that dinged his/her credit and he/she stopped using the service. I could understand why they would check my credit if I was seeking an installment loan, but in the last year and a half, I've only relied on Check ‘n Go for payday loans. When checking my credit records today I discovered that Check ‘n Go, or Axcess Financial Services, has performed a hard check on my credit every time I've turned to them for a payday loan. This translates to a ding on my credit and makes me look like I'm desperate for credit. This is simply unacceptable and I will no longer rely on them for this particular service. Several customers contend that they made payments on time, but the company made errors with their accounts, or wound up taking too much money out of their accounts, so the customer incurred overdraft fees. Some people report duplicate deductions or withdrawals from their accounts on a day that was not expected or agreed upon. Check ‘n Go drafted my payment before the due date. They acknowledged the error but cannot explain how and when they will refund my overdraft fees as well as one day's interest. What is annoying about the situation is they could care less. Again, not fully investigating the company and its policies could wind up causing you to spend more money and time paying off excessive fees. In the case they damage your credit, you could be left with financial problems long after you are able to pay off the loan. While Check ‘n Go is not accredited by the Better Business Bureau (BBB), you can find details about it on the BBB website, including a look through their 83.5% negative ratings. That said, there are times when using Check ‘n Go could be the right choice depending on your situation. Also, Check ‘n Go is a direct lender. As long as consumers adequately review all correspondence and loan information prior to accepting monies, they should know what they are getting into. Rates and fees by state and by product/service are clearly outlined on Check ‘n Go's website. This is often less than a bank's standard overdraft fee, though it can be a percentage of the check amount. By comparison, Walmart's cash-checking service charges 3% for checks up to $1,000, and 6% for checks up to $5,000. If you pay 3% on a $1,000 check, you're paying $30 extra to get your $1,000 check. Reports show that Check ‘n Go charges up to 3% of the check amount to cash a check. That means families earning the median household income earnings of $50,221, and who cash their checks at a rate of 3% per check, pay $1,506.63 a year to get their money. Ouch! Due to its involvement with the Community Financial Services Association (CFSA), Check ‘n Go may be able to offer customers a competitive advantage—and peace of mind—compared to using similar providers. Because Check ‘n Go is part of the Community Financial Services Association (CFSA), they are required to offer an Extended Payment Plan (EPP) to consumers. Other payday loan companies may not offer this if borrowers get into a jam. According to Thomas Fox, community outreach director for Cambridge Credit Counseling, many borrowers get trapped in payday loans, requiring them to take out more loans to cover the cost the original one. 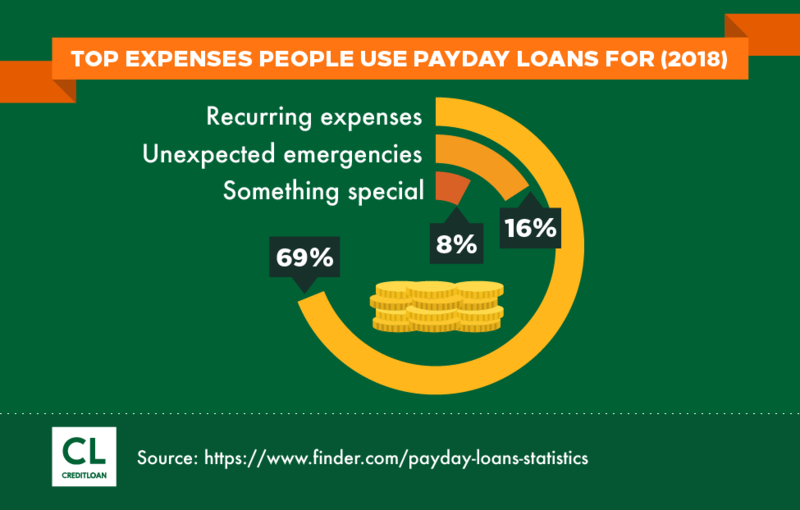 In fact, studies show that only 14% of payday loan borrowers can afford to repay the average payday loan. To qualify for an EPP with Check ‘n Go, consumers must apply for it on the last business day before the loan is due, and they must sign a new agreement. Get the cash you need. Fast. Easy. Get a decision from a lender in minutes! How long does it take to deposit money through Check ‘n Go? If your application is approved by 8:00 p.m. EST, your approved amount should be deposited the next business day. If we are able to verify your information and originate your loan before 8:00 p.m. EST, you will be scheduled to receive your funds the following banking business day. Check ‘n Go cannot process loans on days when banks are closed. If you apply late in the day before a banking holiday, or on a banking holiday, the loan will be originated the next business day, and you can expect to receive your funds on the second business day after applying. For payday loans and cash advances, it can be as soon as the next day if not instantly. What are the requirements for Check ‘n Go installment loans? A verifiable form of income. This can include your most recent pay stub, SSI award letter, or retirement benefits (including pension and alimony). Check ‘n Go does not accept beneficiary income. An active checking account that allows direct deposit. The website says they check your credit and require that applicants have a minimum FICO score in most cases. How does the payment plan/payment arrangement with Check ‘n Go work? Electronic payments are due on your payday. Payment schedules go according to the contract. The company says it will withdraw repayment funds from a borrower's account at an agreed upon date or the post-dated check will be deposited. Borrowers also can return the cash directly to the store. What are the interest rates related to the services offered by Check ‘n Go? No matter the term length, there is a fixed finance charge on every cash advance or payday loan provided by Check ‘n Go. However, the equivalent Annual Percentage Rates (APR) do vary by state. For example, a $500 payday loan in Utah will have a $125 finance charge, regardless of when it is repaid. If the payday loan is repaid within 6 days, the APR rate would be 1,520.83%; if it is repaid within 32 days, then the APR would 285.16%. Reference the Check ‘n Go website for the most current information. How much does Check ‘n Go charge for check cashing? The company says it charges a small fee for check cashing. Although they do not disclose these fees online, BankRate.com claims Check ‘n Go charges up to 3% of the amount of the check. What happens when you default on a Check ‘n Go loan? The payment will be sent to collections if the company cannot withdraw funds from the borrower's checking account. A returned check fee may be charged in some states; however, Check ‘n Go will not collect any additional fees. After 30 days without a payment, the remaining balance will default, interest will stop accruing, and the entire balance will be sent to collections. What are the requirements to get a loan from Check ‘n Go? It depends on the type of loan. You likely need a form of identification (such as a driver's license or Social Security card), information about your bank account (such as account number and routing number), and proof of income (such as a paycheck stub). How much money can you borrow from Check ‘n Go? The company says this depends on a borrower's income and geographical location. Does Check ‘n Go call your employer? Check ‘n Go does not call a borrower's employer but does look for verification of income through paystubs. Can you cash personal checks at Check ‘n Go? According to Yahoo! Answers, Check ‘n Go will cash personal checks with extra verifications and require the borrower pay a large percent of the amount of the check. Do I need to be employed to get a payday loan? Yes, as some Check ‘n Go financial products require you to show a pay stub. For most consumers who needed money in a pinch and did not want to go through a rigorous qualifications process, Check ‘n Go is able to deliver. And, since Check ‘n Go adheres to the Truth in Lending Act, they are required to disclose the cost of credit, which includes the finance charge and the annual percentage rate (APR), so you will be able to determine if borrowing the money you need is a good decision for you. Few things are for free in life. Companies that promise fast cash for little down, should be used with excessive caution. Check ‘n Go is no different. Before pursuing a loan from Check ‘n Go or other companies like it, resources such as the Federal Trade Commission advise you try to find an alternative solution or limit the amount you borrow. Upon asking questions and reading your loan agreement completely—and then determining whether you can realistically pay back the loan on time—you may be able to gain a clearer picture of whether or not Check ‘n Go is the right choice to solve your financial needs. If you need money in a pinch, this company does have a positive track record of helping people acquire funds quickly. They also offer a wide range of options for getting money, whether it involves taking out a loan until you get your next check from work, or being able to cash a check when you don't have enough money in your bank account to cover that amount. Though the interest rates are high and some consumers complained about the service, Check ‘n Go is an established company that provides payday loans, installment loans, cash advances, check-cashing, and prepaid credit cards. There are pros and cons to using this service, so customers will need to be vigilant and acquire a wide range of information to determine whether Check ‘n Go is right for them. Have you used Check ‘n Go? How was your experience with the company?